Some of you might know that in addition to being the Assistant Professor of Early Childhood Education at Post University, I’m also the Executive Director for the West Haven Child Development Center. The center is a nonprofit corporation that provides a variety of educational programs for West Haven children ages six weeks to five years, including a full-day preschool and a program for special needs children. I’ve developed and administered a great deal of educational programs over the years. And I’m very proud that I was asked to present some of my latest work at the National Association of Pediatric Nurse Practitioners (NAPNAP) Annual Conference on Pediatric Health Care last week in Baltimore. For those who are unacquainted, NAPNAP is the professional association for pediatric nurse practitioners (PNPs) and other advanced practice nurses who care for children. It has nearly 7,500 members and 47 local chapters throughout the United States. 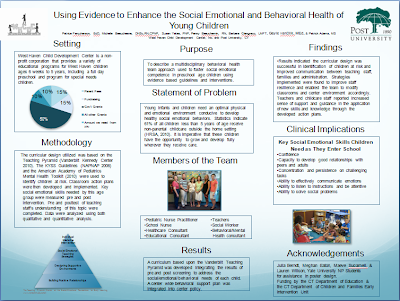 The major goal of our project was to foster social emotional competence in preschool-age children using evidence-based guidelines and interventions. We put together a multidisciplinary behavioral health team, which included a pediatric nurse practitioner, school nurse, social worker, and behavioral/mental health consultant. I served as the educational consultant. Working together, we developed a curriculum with goals, objectives, and strategies to address the social/emotional/behavioral needs of each child. Strategy: Helping children to identify that they are “tense or over-energized, can help them to learn how to relax their bodies. Teaching children relaxation techniques, deep breathing, counting to 10, yoga positions, etc., can help them to learn how to self-regulate. We found that this curricular design was successful in identifying at-risk children and improving communication between teaching staff, families, and administration. Each child was given a Social Skills Improvement System, an evidence-based, multi-tiered assessment and intervention system for helping students develop, improve, and maintain important social skills. The results were then tabulated, and an individual plan was created for each child. Teachers and parents worked together to implement the plan. This also led us to identify six social emotional skills children need as they enter school. Feel free to look over our poster for more details on our curricula design, and let me know if you have any questions or would like to learn more about it by leaving a comment here. This a very important topic for today. Identifying children at an early age can aide in getting them the assistance they need, to develop these important skills. Great job! I agree this is a very important topic today for everyone to know about especially learning those six skills for children to learn at a young age. Those skills will help them throughout their lives and help them do well in school. Children communicating effectively with their emotions and being able to solve social problems will help them deal with their peers and will also lessen bullying in school as well. I liked the poster and I would love to have more information on this. Hi Rebecca. The poster was designed to highlight the research. I can give you move information about the surveys used and setting goals. To the six social skills that you have identified, I would suggest that a vital skill that is invariably overlooked by our education system is the skill of goal-setting. As Harvey Mackay said: "Goals give you more than a reason to get up in the morning; they are an incentive to keep you going all day. Goals tend to tap the deeper resources and draw the best out of life." If instilled as a habit at an early age, the skill of setting and working toward lofty goals can be hugely powerful in determining how much we can achieve in our lifetimes. As a nurse and the sister of a man with Asperger Syndrome, I appreciate this assessment and intervention tool. Thanks!